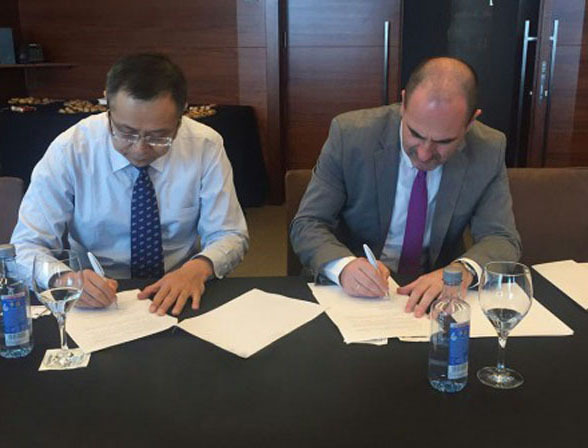 A Chinese delegation with top level representatives visited Spain to meet with IBARMIA and get first-hand knowledge of their solutions for high-performance and high-precision machining. The Norino Group represented by its Vice-Chairman, Mr. Shi Yan, State Administration of Science, Technology and Industry for National Defence, represented by its Vice-President, Mr. Zhang Jianhua, China North Industries Corp., represented by its Vice-Chairman, Mr. Luo Kaiquan, and East China Institute of Photo-Electronic represented by its Director, Mr. Liang Peikang, visited Spain at the beginning of May to get to know IBARMIA and have a meeting with its General Manager, Mr. Koldo Arandia and its Area Manager for China and South East Asia, Mr. Segundo Mangas. The meeting was held in an excellent business climate, and both parties presented their different activities and products, and their more immediate investment plans. The members of the Chinese delegations unanimously expressed their praise for the products presented by IBARMIA, confirming that they fit perfectly into their future investment needs. A stable cooperation meeting was signed with the East China Institute of Photo-Electronic during the meeting, approving IBARMIA for the future supply of 5-axis equipment with multi-task technology(lathing-milling). IBARMIA has already sold equipment to other Chinese giants such as AVIC (aeronautics) and WeChai Power (Energy).